Source: Received an ARC from The PicnicBasket for review. The opinions expressed in this review are mine and do not express the opinions of The PicnicBasket. I just went back to school and found the book in my box. I am glad I had the opportunity to read and review it. 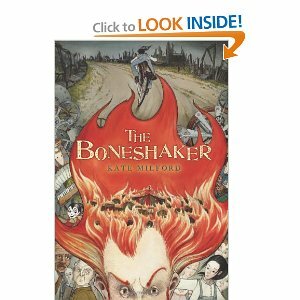 This story is set in 1913 and the main character is 13 year old tomboy Natalie Minks from Arcane, Missouri. She likes all things mechanical and helps her father. When she isn't helping him she listens to her mother who is a master story teller. Things plug along smoothly until the traveling medicine show comes to town. At this point I have to say the book reminded me of one of my favorite movies, "Something Wicked This Way Comes". Natalie must find a way to make the adults in the town believe her. She knows the "doctor" is not really who he claims to be. This was a fun and quirky book. It had history, fantasy, and a spooky, creepy feel throughout the book. I won't say this book is for everyone, but I believe I will have a large number of students who will appreciate this, especially if I pitch it just right. I know it requires some background knowledge that not everyone will have. Still, when all is said and done I enjoyed the book. The illustrations in this book are fabulous.